Dr. Chiachen Cheng contributed to two educational presentations for the UCDavis BHCOE Webinar Series in Fall 2016. 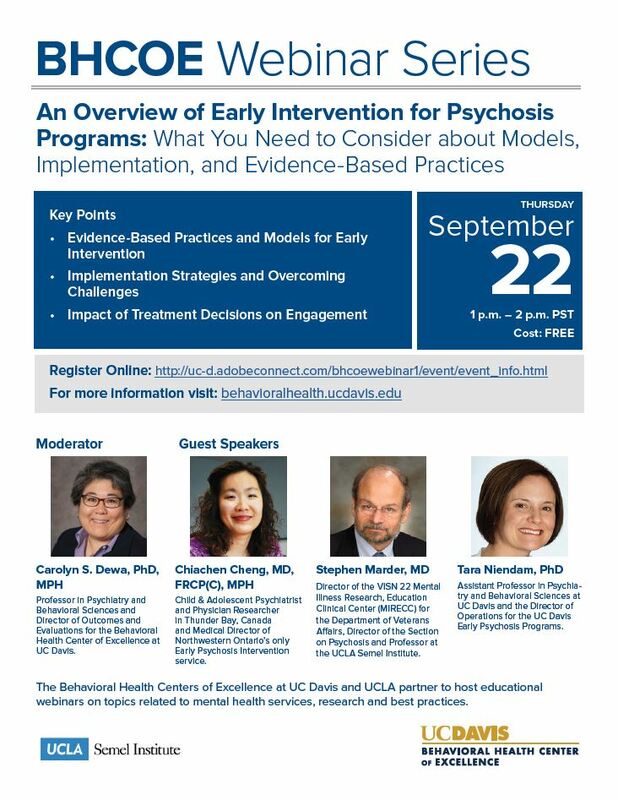 The Behavioral Health Centers of Excellence at UCDavis and UCLA partner to host educational webinars on topics related to mental health services, research and best practices. View the archived recordings and powerpoint slides from Dr. Chiachen Cheng’s fall 2016 UCDavis BHCOE Webinar Series presentations below. Chiachen Cheng, MD, FRCP(C), MPH, Child & Adolescent Psychiatrist and Physician Researcher in Thunder Bay, Canada and Medical Director of Northwestern Ontario’s only Early Psychosis Intervention service. Stephen Marder, MD, Director of the VISN 22 Mental Illness Research, Education Clinical Center (MIRECC) for the Department of Veterans Affairs, Director of the Section on Psychosis and Professor at the UCLA Semel Institute. Tara Niendam, PhD, Assistant Professor in Psychiatry and Behavioral Sciences at UC Davis and the Director of Operations for the UC Davis Early Psychosis Programs. Moderated by Carolyn S. Dewa, PhD, MPH, Professor in Psychiatry and Behavioral Sciences at UC Davis and the Director of Outcomes and Evaluations for the Behavioral Health Center of Excellence at UC Davis. This entry was posted in Education and tagged Academia, Training & Webinars. Bookmark the permalink. ← IEPA 2016: View posters on Slideshare!